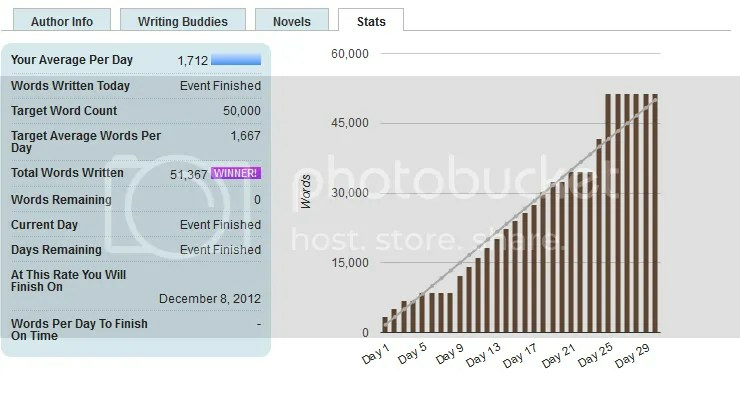 Yes boys and girls, I completed the epic task of 50,000 words in a NaNoWriMo month! (Plus the other essays and assorted writings I was doing during November…) My best day was Saturday, 24 November when I wrote a whopping 11,000 words in a day. It was all because I had taken the weekend off to attend a writer’s retreat on the beautiful Stradbroke Island in Queensland. I’m so glad I did! I met a bunch of awesome people, got very little sleep (thanks to some all-night singing) and absorbed much inspiration via osmosis from the lovely people around me. I will definitely do it again should the opportunity present itself. I have withdrawn from uni for this semester though. I felt that my being away for 3 weeks in January 2013 (a quarter of the semester) would be of detriment and I wouldn’t be able to dedicate my best effort. So far, it’s been two weeks and I’m a bit lost. I have nothing to do… so I thought it would be a great time to start a new blog about watching an episode of The Simpsons every day until I have seen every episode. Follow the insanity here. As for my NaNo novel, I really like the work I have done on it and plan to continue with that journey. Firstly, I need to finish it. Then comes the process of editing and eventually, I think I would like to self-publish on a platform such as iTunes and/or Google books etc. Just to be part of the process, ya know? Thanks to everyone for putting up with me, especially to my boyfriend who basically didn’t see me at all for the last two weeks of November as I spent every waking minute writing or at work. A special thankyou to Bryce Courtenay, who passed away recently. Thankyou for the stories, for your dedication in getting a novel written every year and for sharing so much with us. You’re sadly missed already. Secondly, here’s one of the reasons I have been busy this month. Thirdly, I am also currently writing two essays due this Friday. I’m starting to think I’ve bitten off more than I can chew for this month, this week at least. For the past week, I have spent every waking moment writing. Obviously, I am writing this blog post, but I’ve also been writing 50,000 words for the NaNoWriMo challenge as well as these two essays. (Apologies to my boyfriend, I will be back in reality sometime next week…) I’ve written before about the magic of NaNoWriMo, which never fails to astonish me. When I was a kid, I remember writing a letter to a favourite author asking why she had killed off my favourite character. She actually replied, saying it was something that needed to happen. This has always puzzled me. You’re the author, you get to decide what happens, how could you let this character be killed? As I ventured deeper into the world of writing, I find that sometimes, amazingly, your characters absolutely have a life of their own. 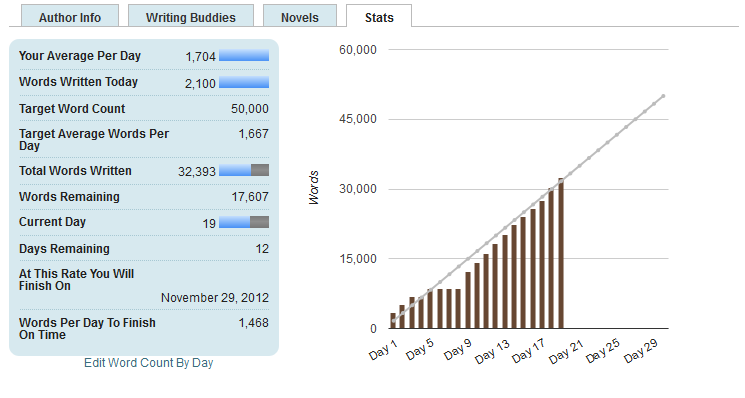 In my current NaNoWriMo project, two of my characters did something I wasn’t expecting. Michelle, the wife, kicked her husband James out of the house after surprising him with some midday shenanigans in his office. Four chapters later, he retaliates by picking up a woman in a bar and taking her home. Where did that come from? Based on the successful word count of that chapter (almost 3000 words), I decided that another male character, Ben, also needed to get laid. I’m sure Ben was grateful for the experience. After an hour or two of letting my brain wander all over the page with NaNo, it’s time to focus on either essay. I don’t mind writing essays but I do find them tedious. For every hour of writing, there’s three hours of research behind it. For the record, one essay is 2000 words about television’s reaction to youth culture by comparing The Monkees with The Simpsons. The other essay is about how radio advanced the discipline of journalism. No, it’s not very exciting but luckily is only a thousand words. Hence my dedication to writing this month, and indeed, taking up almost every available minute of this week in particular. By the end of the month I will have over 53,000 words to show for my effort (not included incidental writings such as emails, this blog post and my shopping list). My point for this blog is this: Writing can be as easy or as difficult as you like. What I have learned over the past two weeks is that I can easily clear my mind by pouring out 1667 words which will hopefully come together as a coherent novel (as an aside, I like this effort much better than my 2010 effort, which is probably only suitable for Mills & Boon readers). After clearing the mind, it is free to focus on interesting tidbits in which to base an essay upon. I’ve also learned that if you are falling behind and need more hours in the day to write, the internet will fail you at work and you will end up spending seven hours texting your friend from another store to pass the time. See you again sometime next week… Assuming I survive this War of Words.